The Vice President of India, Mr M. Venkaiah Naidu addressing the gathering after interacting with the Agricultural Researchers on ‘Doubling Farm Income by 2022 in Andhra Pradesh and Telangana’, at ICAR - Indian Institute of Rice Research, in Hyderabad on March 31, 2018. New Delhi: The Vice President of India, Mr M Venkaiah Naidu has called upon farm scientists to focus on making agriculture viable, profitable and sustainable, besides ensuring home-grown food security to meet the needs of a burgeoning population. He was interacting with the Agricultural Researchers on ‘Doubling Farm Income by 2022 in Andhra Pradesh and Telangana’ at ICAR – Indian Institute of Rice Research, in Hyderabad recently. The Vice President posed several questions to the scientists and elicited their responses on how their research was translating to empower the farmers. 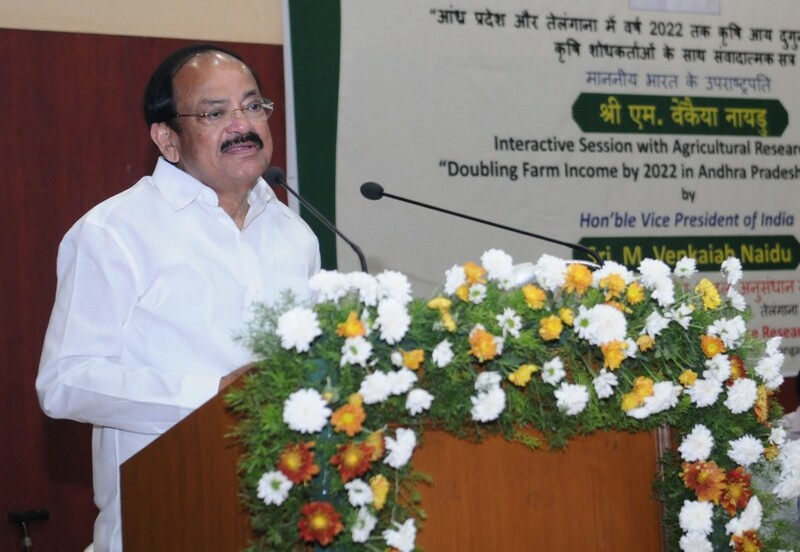 Asking them to come out with innovative and out-of-box solutions to meet the challenges faced by farmers, the Vice President said “A happy farmer makes a happy country”. “We know the problems. What are the solutions, what are the new ideas…what is the way forward to take technology to the farmers” he asked. He pointed out that lack of quality seeds is one of the problems faced by farmers. Similarly, another issue that needed attention was rising input costs. Crop diversification and promoting allied farming activities like backyard poultry were equally important to increase farmers’ income. He also wanted the scientists to make e-NAM more popular with the farming community. Stressing the need for home-grown food security, he said both productivity and production have to be increased as the country cannot depend on “imported food security”. He said the Krishi Vigyan Kendras should become the hubs of activity for farmers. Asking the scientists and researchers to spend “considerable time” with farmers to come out with practical solutions, he suggested that staying with farmers should be made mandatory for students pursuing agricultural courses. Referring to agricultural credit, Mr Naidu emphasized the need for giving timely and affordable credit to the farmers at reasonable interest. Observing that agriculture sector needs a great deal of attention because a majority of Indians still rely on agriculture and allied occupations in the rural areas for their livelihood, he said “We have a situation today where despite phenomenal increase in food production, farmers are not able to get adequate returns from their investment. Agriculture remains an unattractive vocation to many families. We must change this situation”. Asking agricultural scientists and managers come up with solutions that will impact the farmers’ lives positively and increase their incomes, the Vice-President said “We should focus on production and productivity to have adequate home grown food security. At the same time it is not merely increasing the production and per acre productivity alone which is important. It is also important for us to recognise that along with technology transfer and ‘intensification’ of agriculture, there must be strategic ‘diversification’ and attention to the key linkages in the eco-system. The farmers must be supported through market information, ware housing and cold storage facilities as well as the credit, marketing and insurance facilities”. He said the most critical need is to establish a dialogue with farmers and provide them with knowledge and material resources to increase their incomes.